class="page-template-default page page-id-128881 custom-background group-blog header-image full-width singular wpb-js-composer js-comp-ver-5.7 vc_responsive"
The KTIC Morning News 6am-9 Weekdays Dwight Lane hosts a blend of area news, weather, agriculture markets, local sports and West Point-area events each morning from 6 to 9 on 840 Country KTIC and Classic Country 98.3FM. It’s like hearing from a good neighbor.The KTIC Morning News” features Chad Moyer’s award-winning coverage of agriculture long with Rural Radio Network market and ag news.ABC Radio and KTIC’s Rick Vincent provide “Team Coverage” of world and local news updates at the top and bottom of each hour. You’ll also hear ‘Headline Sports in 840 Country” through the morning. Dwight and the Morning News Team also visit with area guests about local topics ranging from education to the economy, agriculture and area entertainment. To break up the information, you’ll hear “Country’s Greatest Hits,” from your favorite artists and occasional songs of faith and American patriotism. You can play Monogram Money EVERY morning at 8:40. You can win cash if your initials match the three letters that we draw. KTIC has given away tens of thousands of dollars to listeners over the years, playing Monogram Money. Start your day 6-9 with ‘The KTIC Morning News, on AM 840 and locally on Classic Country 98.3 FM. We also stream our programming world-wide over our website, kticradio.com. 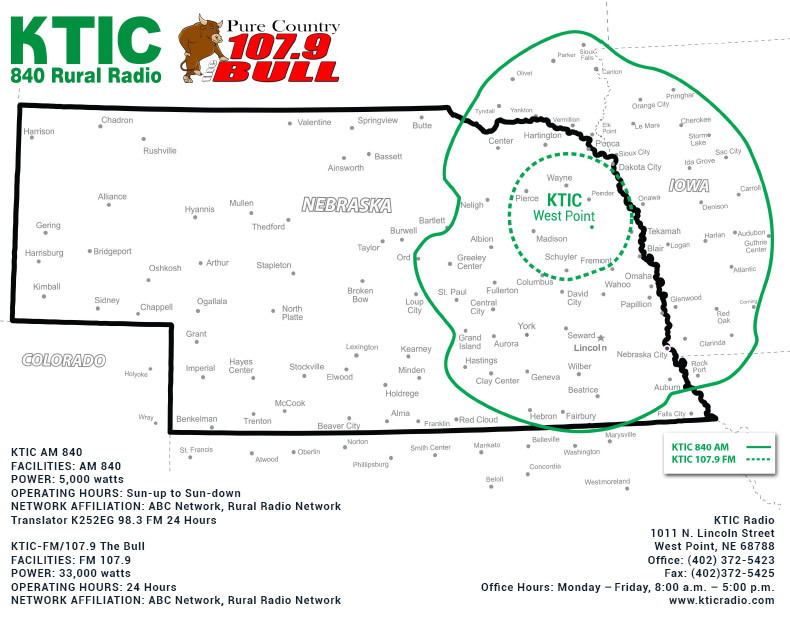 11A-1:30P JD Gibbs brings you KTIC Midday in MidAmerica Show. KTIC Sports Director Joel Janecek has ‘Headline Sports in 840 Country” several times through the mid-day and afternoon. Spend the middle of your day with J.D. Gibbs on 840 Country KTIC and Classic Country 98.3FM. Kevin Cooper hosts “The Afternoon Roundup”, weekdays between 1PM and 5. Hear all-important closing market information, along with news, weather and sports in 840 Country. Along with all of the information, Kevin also brightens up your afternoon with Country’s Greatest Hits! Hear Garth Brooks, Johnny Cash, Kenny Rogers and many more of your favorite artists on West Point’s 840 Country and Classic Country 98.3FM. Saturdays from 6AM until 12 Noon, 840 Country keeps you updated on local news, weather, agriculture and sports, also heard locally on Classic Country 98.3FM. Rely on ABC for top-of-the-hour World News, along With northeast Nebraska weather in 840 Country. Every fall, we bring you Nebraska Cornhusker football each Saturday on AM 840 and on Classic Country 98.3FM. Sunday mornings on 840 Country KTIC and Classic Country 98.3FM are special. We offer you a blend of shows about faith and inspiration, like Walk in the Light at 8:30AM…and a blend of gospel music that you’ll enjoy. Rely on ABC for top-of-the-hour World News, along with weather in 840 Country. From 12 Noon until 2PM, hear ‘Classic Country Today,’ featuring artists such as Marty Robbins, Tim McGraw, Loretta Lynn, Alabama and The Oak Ridge Boys. From 2PM until 4 on Sundays, “….It’s Polka Time!,” a local favorite. Then, hear an hour-long mix of special Country and Western music and conversation during Cowboy Corner, Sundays from 4PM until 5. Classic Country 98.3 FM When the Federal Communications Commission granted AM 840 KTIC our license to go on the air—it was with the stipulation that it always be a signal covering much of six states, and be on-the-air during daylight hours. So, if you live within a 20-mile radius on West Point, you can hear KTIC programming 24-hours every day on 98.3FM. And, you can hear KTIC programming anywhere on Earth on our audio stream at kticradio.com and on your phone or mobile device. Late-nights on 98.3FM, hear ABC World News at the top of the hour, followed by ‘Weather in 840 Country.” Then…settle back and enjoy Classic Country music in FM…all night long!